• Poly Sheeting is commonly known as builders film as it provides protection against dust, debris or water. Or used to create a water barrier under concrete slabs. • Used in the painting industry to protect flooring/walls against paint spill. • A wide range of sizes to suit all applications. • Available in black or clear plastic. • Custom sizes are available upon request. Custom perforations are a great option to easily tear off required sheets of plastic. For more information and pricing please contact one of our friendly staff. 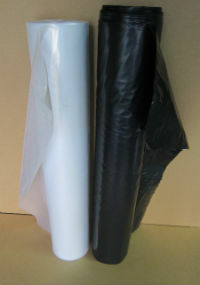 • Poly Sheeting can come centre fold on the roll for ease of use.